Electricity makes sparks, as everyone knows. 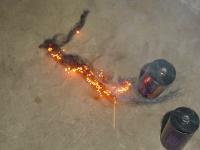 Harnessing that spark to create a fire is pretty easy and fun to see. Have your fine, dry tinder ready. 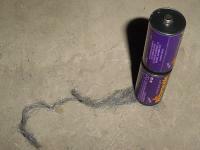 Get some fine steel wool - 0000 grade left over from polishing your pop can fire starter would work great. Pull the steel wool into a thin length about 6 inches long and 1/2 inch wide. Get a 9-volt or a couple of "D", "C", or "AA" batteries. 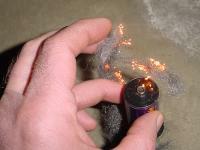 Touch the steel wool to both contacts of the battery and the steel wool will begin to glow and burn. It does not burn long, so get it into your tinder quickly.